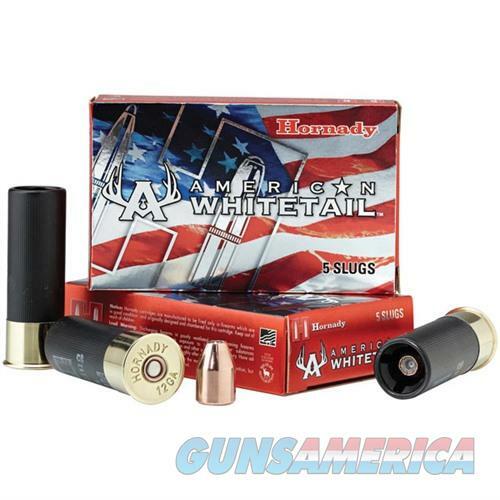 Description: Hornady 86234 AMERICAN WHITETAIL AMMO 12 GAUGE 2-3/4" 1 OZ RIFLED SLUG The 12ga Rifled Slug is designed for smooth-bore barrels and is loaded with a 1-ounce foster style slug. The hollow point style slug features a tough, lead alloy core loaded to 1,600 feet per second. The compression style wad protects the slug at ignition and helps to seal the bore for maximum velocity. The 325gr InterLock Slug was designed for fully rifled barrels, loaded with a 325 grain Hornady InterLock Bullet. A hollow point serrated design initiates rapid expansion upon impact, and a tough, lead alloy core is lethal out to 200+ yards. The rigid polycarbonate sabot ensures accuracy. The end result is an accurate delivery system for a tough shotgun slug capable of taking the biggest midwestern whitetails. Shot Weight (ounces): 1 oz.